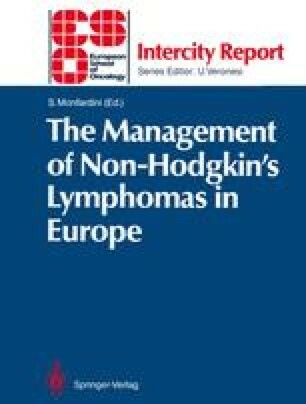 Non-Hodgkin’s Lymphomas (NHL) are a very complex group of diseases and there are many reasons which prevent the physician from confidently being able to base management decisions on published data from studies on NHL. The choice of treatment requires a balancing of radiation therapy (RT) with systemic chemotherapy (CT). In some cases, RT alone may be sufficient, whereas in the presence of advanced disease or of unfavourable histologies a large number of patients have to be managed with CT, either alone or in combination with RT.